Morpheus Labs is building a robust ecosystem of services and applications to help global businesses, of all shapes and sizes, embrace the blockchain. At the heart of our solution is our native MITx token, the fuel that powers the Morpheus Labs ecosystem. We have outlined below the basic design goals of our token ecosystem. In light of these points, we have decided to go against making MITx a simple payment currency for Morpheus Labs services. Based on our decades of experience in the enterprise software space and consulting our partners during the design process, it was concluded that forcing customers to directly buy MITx tokens for the open-market will add unnecessary friction to the onboarding process. As such, we have developed a model with our treasury and liquidity partners to purchase MITx on behalf of our customers in an automated fashion. It is important to once again iterate that the MITx token is not a settlement or payment token. The design of MITx is centered around the access/work token model. Below is a flow diagram that illustrates the token flow within the Morpheus Labs ecosystem, within the platform and beyond it as shown with our community and treasury partners. A critical component of a robust economy is the flow of tokens, otherwise known as token velocity. Ensuring efficient circulation of the MITx token is imperative for the success of the platform. Before delving into the details on the on-platform/off-platform token flow, we will start by explaining a key component of our model’s liquidity. Our development platform will be exclusively powered by MITx tokens. As mentioned previously, we recognize that rather than force customers to purchase MITx of the open-markets, as such Morpheus Labs will convert FIAT payments into MITx by purchasing tokens from the current circulating supply on the market. Central to this model, are our Treasury Partners (TPs). Treasury Partners can be liquidity providers, brokerage firms, OTC desks or substantial investors in MITx tokens that buy directly off the market and provide MITx tokens for our customers. This model reduces the friction inherent in dealing with crypto-asset exchanges for our non-trading savvy platform customers, while providing a fundamentals-based mechanism for investors and service providers to monetize their MITx holdings. The appointment of TPs will be subject to our discretion based on a multitude of criteria, chief among them will be the size of their MITx holdings and consistent trading volume. Below, we have outlined the five general pillars of our token circulation model. That will be followed by a detailed overview on our Proof-of-Alliance mechanism. For customers to use the platform, they will be directed to pay in either USD/SGD via traditional payment methods or opt to pay directly in MITx tokens. 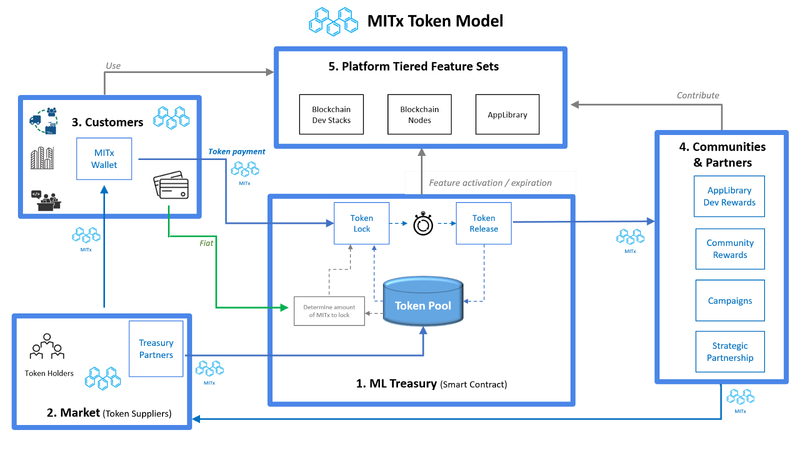 In both scenarios, MITx tokens will be bought from the open-market, whether the customer already owns MITx tokens or not, as described in the previous section on Treasury Partners. For the trading/blockchain savvy customer, they can opt to purchase tokens directly off appointed treasury partners for efficiency or for themselves on the open-market. We anticipate this class of customer to be in the minority. The more likely scenario will be customers that choose to pay their subscription fees in USD and interact with our built-in smart contract mechanism which pegs the fiat amount paid to the current MITx exchange rate with our treasure partners. Once activated, the corresponding MITx amount will be locked. Please note that this mechanism is currently being built, in the interim we will manually purchase the fiat equivalent amount of MITx from our treasury partners. Upon expiry of the subscription period, the tokens will be unlocked. The AppLibrary is an open marketplace where enterprise, startups and individual developers can develop and publish applications that will be usable by businesses and their customers globally. Morpheus Labs will charge a commission on fees imposed by the publisher. These include application or component download fees, one-time in-app purchases and recurring application subscriptions. Again, the MITx token will be used as a discount token for application publishers and application users. Application publishers will be required to hold MITx as a security deposit and they will be incentivized to hold MITx tokens in order to be eligible for discounts on the commissions payable. Application users are also incentivized by holding MITx tokens when downloading applications. In addition, referencing back to our Proof of Alliance article, Application users holding specified amount of MITx tokens will be entitled to provide app reviews and get involved in an AppLibrary revenue share scheme. We will be releasing more information on the revenue share scheme as well as more creative PoA implementations going forward. So, stay tuned for that! Our blockchain providers are vital to the success of Morpheus Labs. They provide the blockchain infrastructure and protocols that allows us to serve as a gateway for businesses to implement blockchain technology. As outlined in our revenue model, protocol partners will be required to pay a listing fee which is payable only in MITx. We will also continue to develop deeper partnerships with our protocol vendors which may include building developer communities, research collaboration and community outreach, among other initiatives. MITx tokens will also be used as ‘gas payments’ for the underlying protocol. This feature is in development and will be applied to blockchains that feature ‘gas’ as a transfer mechanism. While token circulation within the platform is imperative, ensuring adequate usage of the token outside the platform will also greatly enhance the utility of MITx. As such, we have developed the concept of community ‘nodes’. Avid supporters of Morpheus Labs, be they developers, marketing experts or community managers can set up a ‘node’ tasked with hosting meetups, drumming up support and engaging with other blockchain enthusiasts on behalf of Morpheus Labs. Partners will be required to ‘stake’ a specific amount of MITx for as long a they are running their community within their city. Partners will be eligible for MITx rewards based on performance in community building, both in the digital world and by hosting real world meetups and events. We will be releasing a more detailed blog post soon with the exact requirements and application form. The product council will be a closed group of community members comprising of developers and non-developers, tasked with assisting and engaging with the Morpheus Labs development team as new updates are released. They will be tasked with assisting in the debugging process, providing feedback and suggestions on new features. Top developers may also be part of the DApp listing approval process on the AppLibrary, depending on their skillset. Members of the product council will be required to hold an amount of tokens for as long as they are part of the group. We will be releasing a more detailed blog post soon with the exact requirements and application form. DApp developers are incentivized to stake MITx tokens for increased visibility within the AppLibrary. Depending on the amount of tokens staked and the duration, developers can have their DApps featured at the top of the search results within their relevant category. This will be done via a tiered approach. The minimum tier will start at staking $100 USD worth of MITx a month, with a minimum holding period of one month. Developers that can’t or won’t buy MITx off the open market directly, can commission ML to buy MITx and lock it within the platform on their behalf in a manual fashion. This will be the case until our automated system is in place with our Treasury Partners. It is important to note that the maximum discount awarded to eligible platform users will be 25%. Please note that the above numbers are placeholders and will continue to be adjusted in the case the token price fluctuates widely to ensure the dollar value of the above stakes remains constant over time. As explained in the previous section on developers, Morpheus Labs will commission our Treasury Partners to buy MITx on behalf of our customers, in exchange for fiat. As outlined in our initial token economics paper, distributors are a key component of our growth strategy. As such we have integrated a staking mechanism for MITx in order to enhance value capture. As explained in the previous sections, Morpheus Labs will commission our Treasury Partners to buy MITx on behalf of our customers, in exchange for fiat. Morpheus Labs has designed a token economics model to ensure efficient token circulation across all stakeholders within the ecosystem. This extends beyond the confines of the platform to our global community partners and liquidity providers. Managing token velocity, frictionless onboarding and maintaining demand are key design considerations throughout the entire process, as such our token model has a bias towards reducing velocity and increasing value capture.